It’s National Bavarian Cream Pie Day, in these United States. The Newtown Pentacle in back in session. Aimless, a wandering mendicant found himself recently at a juncture. It’s always been my practice to follow instinct when out on a photowalk, but during those times when my schedule is tightly packed, the efficiency of a given route often trumps the voice of that little birdy that instructs one to turn left or right. Binary logic trees tumble forth from out of these choices – if I go left it takes me towards… – if I go right, I’m heading for… – and so on. Recent interludes have allowed one the temporal freedom to acknowledge and follow the advice of the voices in my head, which is how I ended up on the 7 train one recent afternoon. 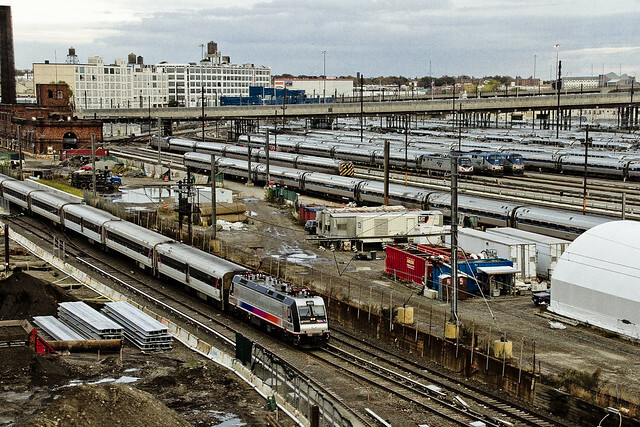 This section of the glorious IRT Flushing – or 7 line – was built in a few distinct stages, here in Queens. 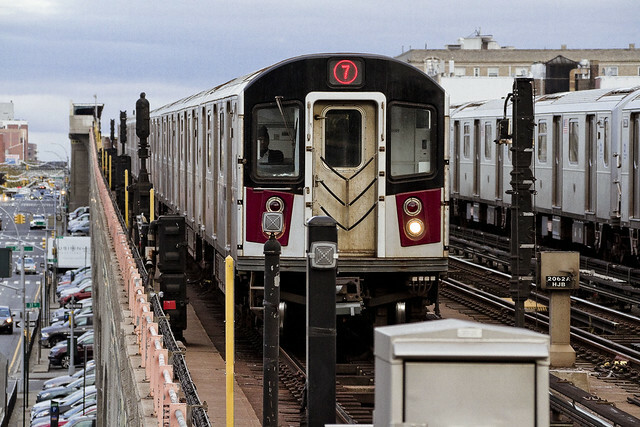 It wasn’t until 1928 that the line reached its modern terminal destination in Flushing. 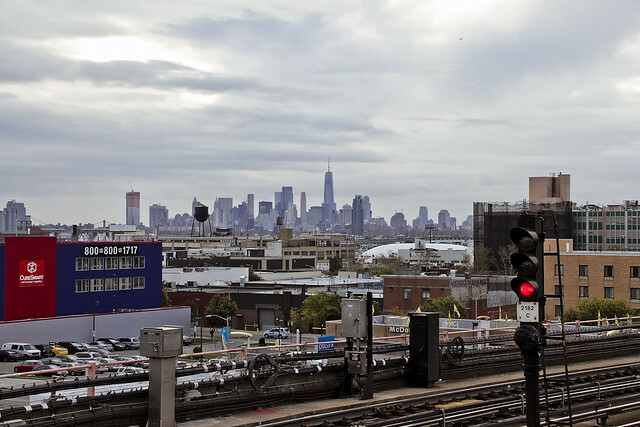 The stops between LIC and the City (Grand Central Station in Manhattan, Hunters Point Avenue, Court Square, Vernon Jackson, and Queensboro Plaza) having opened in 1915. The second section to open was the QB Plaza to 103rd st./Alburtis Avenue section, and that happened on the 21st of April in 1917. I helped organize the centennial event for that anniversary, btw, with Access Queens and the NY Transit Museum. A productive habit one has acquired over the years, while researching and writing about the garlands of municipal wonder stitched large across the geographies of the Newtown Pentacle, is to take note of historic anniversaries recorded in the historical record and then to set up a calendar item on my phone which repeats annually. After all this time, I seem to have developed the beginnings of an “On this day in NYC history…” database. So much of what we think of as “nyc” was built or created in the 1900-1940 era, one predicts that attending centennial celebrations are about to become quite a common experience. I’ve been lucky enough to be at the center of several of these sorts of events over the years. I worked on the Queensboro Bridge and Madison Avenue Bridge centennials, was a parade marshall for the Manhattan and Hunters Point Avenue Bridge events, and as mentioned – helped organize the Access Queens IRT Flushing Line Corona Extension event. 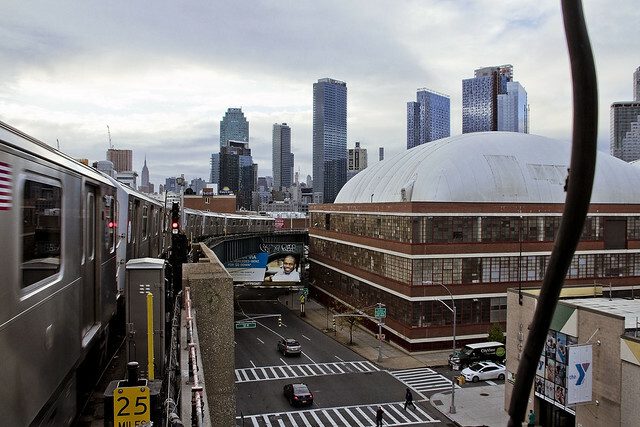 Digressions aside, my impulse to climb up the stairs to and purchase a ride on the 7 train towards Queens Plaza allowed a visual vantage point to photograph the Sunnyside Yards, which is always a plus. Often, when riding elevated lines, I’ll pick out the cleanest window on the side of the subway which is shadowed by the sun and set the camera to an infernally fast shutter speed and narrow aperture (with commensurate compensation for ISO, of course) for a “spray and pray” series of shots recording whatever is passed by. Adoption of a weird physical posture is called for, during which one’s body is used as little more than a shock absorber and camera support. The particular one used by a humble narrator usually results in more than a little discomfort in the lower back and the beginnings of a cramp in my right foot. Most of what you get are throwaway shots, incidentally, but with digital photography you’ve got no reason not to experiment constantly except when available card memory is short or battery life is limited. There’s a few shots in today’s post, notably the first and last, which were “experimental” in terms of using a newly acquired bit of kit. In recent years, work on developing the skill set, and collecting the “bright” lenses, to negate the necessitude of using camera supports like tripods has been undertaken. One has been somewhat successful in this endeavor, so a minor investment at a recent camera show resulted in the acquisition of a truly transportable tripod. This sturdy gizmo barely qualifies as a “tabletop” unit, but it weighs virtually nothing and can be carried around in a coat pocket. Despite its dimunition; the unit has a ball head, supports the weight of my standard carry around lenses, and sets up rather quickly. As mentioned above – the Newtown Pentacle is, indeed, back in session.